Back in around 2004-5, a new puzzle came along. That puzzle was sudoku. And it did rather well, it's fair to say. After a while, people started looking for other sudoku-type puzzles to play. Out of those various creations, one of the best variants is undoubtedly jigsaw sudoku, also known as irregular sudoku. It has all the good qualities of sudoku whilst adding something novel into the solving mix - the fact that there are lots of different types of grid patterns, which all solve in a slightly different way whilst using the same familiar sudoku logic. Jigsaw sudoku puzzles require you to place 1-9 in each row and column, just like ordinary sudoku, but the familiar square 3x3 box region has been replaced with an intriguing range of different shaped regions containing nine cells that fit together to create the grid, a bit like a jigsaw - hence the name jigsaw sudoku. 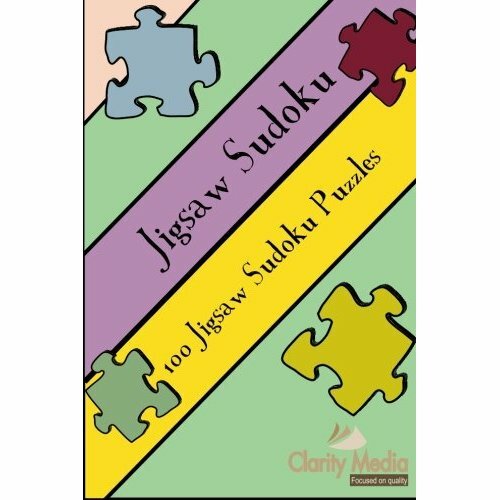 This jigsaw sudoku book features an all-new collection of 100 fantastic puzzles (now available in Volume 2 with 100 brand new puzzles). They require logic and nothing more to solve - no guessing is ever required. If you like standard sudoku, you should enjoy this book. 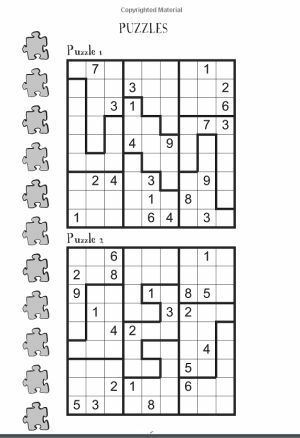 These puzzles tend to be slightly harder to solve than ordinary sudoku and take longer to solve as a result, and there is a great sense of satisfaction in cracking a particularly tough puzzle. As with all our puzzle books, full solutions are included at the back for you to check your answer or even if you fancy cheating a little! The core rules of jigsaw sudoku are the same as standard sudoku. However the introduction of the irregular jigsaw-like regions means that the solving experience is not only very different, but that it can vary from puzzle to puzzle depending on the shape of those regions. Because the eye finds it harder to keep track of the irregular regions than normal, regular shaped ones, most people find jigsaw sudoku a lot trickier to solve, although for a computer there is no difference. The shapes of the regions usually allow more deductions to be made than with standard sudoku, so you will typically see less givens with jigsaw sudoku than standard puzzles. The key is to follow carefully the shape of each region, and make any removals you can. The rule called region intersection is particularly useful to narrow down options with jigsaw sudoku - here where a square is in multiple regions, we can use deductions from one shared region to restrict options in another, and the interestingly shaped regions in jigsaw sudoku often are great at helping us do this. For an example of how unusually shaped regions can often quickly help you make progress, look at the image of puzzle 1 in the book shown to the right. Note that there is a 7 in row 4, column 8. And also see how unusual the shape of that region is. This information can be used to place the 7 in the final column, believe it or not! That's because the region has five squares in common with the final column, and therefore the 7 cannot be placed in either. The column already contains 2 and 6 outside the shared cells, leaving only two: the first and last square in the column. The first of these is in a row that already has a 7 so that only leaves one square for the 7, which is the bottom right square of the grid, so the 7 can be placed there: this just goes to show how useful unusually shaped jigsaw regions are with regard to making progress in solving these fun puzzles. If you have any particular tips or tricks you use when solving jigsaw sudoku, just let us know and we'll add them here!